"Roofing contractor Rob happened to be going door to door at the time I was getting ready to call around for new roof, perfect..."
Roofing contractor Rob happened to be going door to door at the time I was getting ready to call around for new roof, perfect timing, great salesman! No need to look any further. In this industry, I really look out for trust, reliability, and hard working people- that's why I love Exceptional Exteriors. Roofing Contractors are rated #1 on the BBB's hit list with over 3.4 million complaints! Meanwhile the Small Business Administration has found that 96% of roofing contractors fail within their first two years, leaving homeowner's like yourself exposed. My job is to protect you, not only from the demanding weather of Colorado, but from all those "Elements" just dying to get into your home. This makes my role incredibly important. This is more than a job... it is my mission. I strive to educate and guide you towards the best possible scenario for your home, your pocket book and your future. Armed with the high integrity team of Exceptional Exteriors and a strong history of Project Managment and Leadership roles, I promise I won't let anything get in the way of the roof you both want and deserve. In my spare time, I am interested in photography, backpacking, mountain biking, food & wine, home improvement, and travel. Some of my accomplishments include being the owner of RCVisual for 15 years with a 1st place spot News Photo, being an Eagle Scout and part of the Order of the Arrow with the Boy Scouts of America, and having an amazing familly being a father of 2. Still Damage in Colorado Springs! Although the roof looks similar in these photos, we can assure you that the 2nd picture shows a much more durable and strong roof. The new Owens Corning shingles in the color "Driftwood" are Impact Resistant and will protect the home from future hail damage. Estate Gray is a great color on this brick home. We added a ridgevent for extra dimension and ventilation. In these pictures, you can clearly see the difference between an old, damaged roof and a fresh, new roof. It can be hard to show the damage in pictures unless they are close ups, but here you can definitely see how the years of damage really show on the before roof. 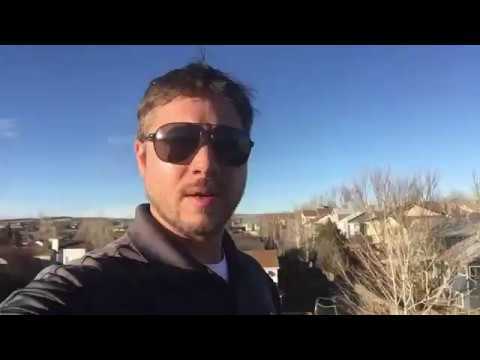 These Arvada, CO homeowner is definitely happy about the results and says he would recommend us to anyone. The recent hailstorm was an opportunity for his Homeowner to replace their out dated shingle and mismatched vents. The Duration Storm shingle in Estate Grey looks great with almost every siding color.